These days, you don’t need to go to an expensive masseuse to enjoy a professional foot massage. Thanks God, robots have invaded the massage industry! If you’re constantly on your feet or regularly working out, then recovery is an important part of your routine. And it is very important to take care of yourself. This is where a foot massager can come in handy, as it works to help relax and relieve sore arches and knots. Let me tell you my own story: nothing relaxes me like a good foot massage! that is why I love Thailand so much! If you’re anything like me, you probably love it when someone takes the time to give you a really thorough foot rub at the end of the day. Just like your neck, back, and shoulders, your feet can also benefit from a regular rubdown. Do your need reasons to realise why is good for your body a foot massage? A Foot massage improves circulation, stimulates muscle and reduces pains. Some people prefer intense ones that really get the knots out, while others prefer a more gentle and soothing massage; possibly with some heat to relax their muscles. We are different, but there are gadgets for all of us. Finding the best foot massager for yourself means reading reviews, studying product features, and diving into the ins and outs of available attachments and configurations. It is a hard-hard work, but we did it for you! With the right foot massager, you can kick back and relax after a long, hard day. We reviewed dozens of foot massagers to identify the best of the best, based on Amazon reviews, how well they performed in operating tests, cost, and other considerations. In general, we were looking for foot massagers that were easy to operate, comfortable on our feet, and had a substantially positive impact on how our feet felt after five to 10 minutes in the massager. One of the easiest and most beneficial ways to soothe the pain and relax is with a foot massage. We narrowed our search down to 10 of the top-rated foot massagers homeowners can purchase to help soothe their aching feet. These are the best foot massagers you can get to maximize your at-home relaxation time. Let’s start to discover the best foot massager for 2019! Our team of experts has selected the best foot massagers out of hundreds of models. 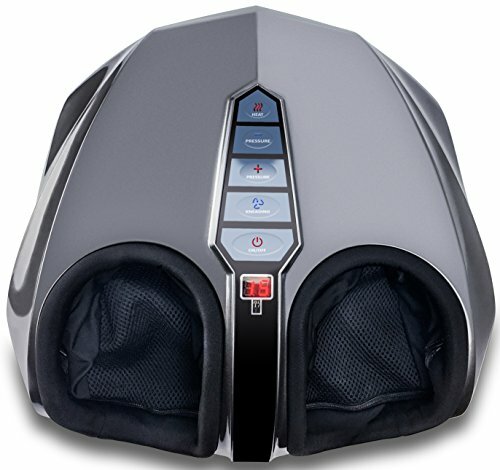 Don’t buy a foot massager before reading this article. It will help you a lot! Below are the reviews of some of the top best foot massagers to help you select from the many options offered by Amazon. We’ve identified the Miko Shiatsu Foot Massager as the best foot massager out there. With multiple settings and adjustments, this foot massager is one that will keep your tootsies feeling happy. These benefits allow you to recover faster, perform better, and live in more optimal health. We also found the MedMassager – 11 Speed to be highly effective for individuals who are most interested in improving circulation in their feet and legs. The ergonomic design is no accident. The foot pad had been designed at the optimal angle for most comfort whilst massaging. This Foot Massager is engineered to exacting standards in an ISO 9000-2001 manufacturing facility and is CSA certified for safety and reliability. Not only that, but this massager is also FDA certified for therapeutic use. The price includes an unprecedented 1-year full replacement against defects and failure. Using it for my neuropathy and my wife gets cramps in her calves almost nightly so she uses it too and the cramps have stopped! This item is really worth the price and my doctor is happy with me for buying it. Kind of expensive but how much is daily pain relief worth and being able to get up every morning with comfort after having had a great night’s sleep? Applying varying degrees of pressure and angling the foot in different positions can also have benefits often realized with reflexology, which targets pressure and trigger points found in the feet. SOLEMENDER’s innovative design works to alleviate foot pain by cooling affected areas in the feet, arches and heels, while reducing inflammation. After freezing the reusable metal roller, simply roll each foot and heel to experience relief in a few relaxing, therapeutic minutes! Foot and heel pain can make normal, everyday activities – such as walking, standing, running or exercising – virtually impossible. Unlike traditional foot rollers and massagers, SOLEMENDER uses an innovative design that utilizes a removable and re-freezable metal roller to alleviate painful symptoms in the feet, arches and heels. The all-inclusive design includes a non-skid pad and metal roller with cooling gel that gently massages sensitive areas in the soles of the feet and soothes inflammation for effective relief from pain and discomfort. The device is intended to be used as a massager to relieve muscle pain,increase blood circulation,relax stiffness muscles,reduce swollen feet and ankles and fatigue.The massage effect is achieved by electronic stimulation of the nerves. It is not just a simple foot massager but full body massager which comes with 4 pieces electrode pads,it can relax other parts of your body, such as neck, arm, shoulder, waist, leg, etc. Bought this as I have circulation problems with my feet, Great leg and foot massage using low voltage electricity. I had a small problem with my unit, called customer service and was amazed at the quick response,. I would highly recommend this unit. Using the Lawei EMS Foot Massager is like experiencing a relaxing foot massage while simultaneously receiving an all-encompassing deep tissue massage. Find a comfortable seat and place your bare feet on the foot pads. When using Lawei massager device, please note that both of your feet (without socks)should be on the machine at the same time, or there will be no effect. Sit back, relax and let LAWEI go to work while you watch TV, read or work at your desk. It is recommended to use LAWEI for 25-30 minutes per day. Once finished, its compact and discrete design makes it easy to tuck under most sofas. Compression massage is a new method in massage. To initiate compression and massage around the legs. The compression and stimulation can reach meridians, deep muscle, blood vessels and lymph circulation. When inflating, the vein vessel is drained and this accelerates the vein and lymph backflow and promotes blood circulation. When deflating, the sudden depression enforces the artery filling to make the vein rapidly fulfilled, this accelerates the blood circulation and activates the metabolism. Silvox leg massager for circulation is FDA cleared, the highest standard in the world. Equips with USB charging and upgrade massage intensity of the leg machine increases by 50% than other similar products. Charging 2 hours,relaxing 2 hours. The air bag and Velcro of Air compression leg massagers are extended.One size fits kinds of calves and feet.No matter thick or thin. 2.4lbs light weight can be use at home, office or travel. Save more money, get the massage parlors away! Are foot massagers good for neuropathy? Neuropathy is a common side effect of diabetes and is often relieved through foot massagers. Massaging the feet helps to stimulate the blood flow and promote better circulation when the feet feel sore or numb. You may feel a little uncomfortable or pain during the first few usages, wear socks and shorten the time usage to help your feet adjust. The pain indicates that the product really works, you will get used to it and start to crave it because they hurt so good! Made of artificial PU sole and EVA materials, our foot reflexology massager is non-slip and safe to wear, an exceedingly innovative alternative to the traditional reflexology sandals. These are awesome! My partner and I just started using these shoes but so far, we both love them! Yes, they hurt….but in a really good way for me, akin to like a deep tissue massage. They are definitely a therapy product, not meant for walking out and about. I wear them around the house while doing chores. I love that they are made from actual stones. I have plantar facitus, and have been looking for ways to help relieve the discomfort in my feet. Thi product has been AMAZING. I keep it at the side of my bed, so I can use it every night before bed and each morning when I wake up. It feels SO GOOD, it’s one of those things that once you use it, you don’t know how you ever got through life without it! Not only does it relieve pain, but it helps me start my day feeling a little bit more energised, and as a mom of 3, every little bit helps! For me personally, I wish they had one just like this but had all the rungs like the bottom one, (with the small wooden lrongs with small rounds of wood at the end) as that one feels the best on my feet. I would highly recommend this product to anyone who wants to treat their feet! If you have plantar facitus, you need this in your life. Safely stretch any sized foot with the Vive foot rocker. Ergonomically designed, the motion of the foot rocker gently and evenly stretches the foot to relieve pain, improve circulation and reduce fatigue. Additionally, the foot rocker isolates the lower leg muscles, tendons and ligaments for an effective deep stretch to reduce injury and muscle strain. Reducing pain from plantar fasciitis, Achilles tendonitis, ankle strain, arch pain, and other painful conditions, the foot rocker encourages correct foot posture. Increasing range of motion and flexibility, the safe stretches also minimize heel, leg and back discomfort. Perfect. It’s wider than most that I’ve used in gyms and the physio’s. And I love the non-slip on the bottom although that’s the only part that can improve slightly; it could be a little more tacky but not enough to take a star off. I have a size 6 foot and can use it with or without shoes. My son has a size 11 foot and he prefers to use it with shoes. He says that without shoes, the back digs into his heels a bit. But the instructions clearly state to wear shoes. So there you have it. The foot massage machine is designed to soothe foot and heel pains. Many mini ergonomics massage nodes work on your feet to relax sore, tired, and achy feet after all day long time of working or standing. The combination of shiatsu, kneading, rolling and air pressure makes it be the perfect foot pain reliever. The Miko shiatsu foot massager has 2 independent panels, equip with 18 massage nodes. Strategically placed massage nodes help target specific pressure points to relieve pain and stress. Enjoy a deep kneading foot massage at the comfort of your home or office. The massager helps to cope with the effects of plantar fasciitis, nerve damage, tired feet, and many more. Heat setting allows your muscles to relax in order to receive a thorough massage that you will enjoy for years to come. These compression foot sleeves provide instant relief to your arch and heel through compression support that provides the maximum boost to your blood circulation. Better oxygen circulation helps reduce lactic acid build up and aids muscle recovery in ankle and feet, including your heel and arch. Why let yourself suffer any longer? Walk freely with our compression foot sleeves and perform physical activity pain free again!